By simply using your body's natural ability to balance. ​We call this Balanced Active Sitting™. It is a new and unique development in office chair design that allows you to strengthen your core muscles, improve your posture and burn more calories as you sit. SitTight is the key to unlocking the value of a standing desk! 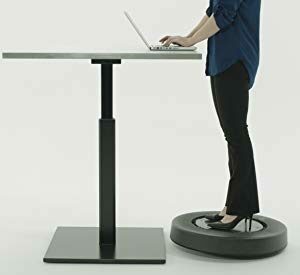 Many users of standup desks struggle to stand at them for long periods of time without experiencing pain in their feet, ankles, knees, hips, back, etc. In addition, recent studies reveal that standing desks by themselves are not the answer to reversing the negative effects of sitting, due to their negligible impact on heart rate and caloric burn. By simply removing the seat portion of the SitTight and standing on the footrest platform, you can balance as you work at your standing desk. Why not just sit on an exercise ball? 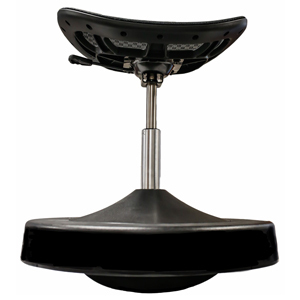 The SitTight chair can be used much the same way as a exercise ball when you sit on it with your feet on the floor (Active Sitting), but with one major safety advantage. The SitTight has a tip limiter that only allows you to tilt 15 degrees before it stops your movement. Many companies have banned exercise balls in their offices because of the number of workplace accidents they have caused. Additionally, when you move your feet from the floor to the footrest platform on a SitTight, you are able to balance on your center of gravity. Balancing on a SitTight requires you to sit with proper posture and it substantially increases the amount of calories burned verses sitting on an exercise ball. How much exercise can I get on a SitTight? The amount of effort required to sit on a SitTight is adjustable based on the amount of air pressure in the air bladder. Please watch our How To SitTight video to learn how you can start out slowly and work up to higher levels of fitness as your balance and core strength improve over time. We recommend the use of a heart rate monitor and a corresponding app to record the impact of a SitTight on your health as you progress. SitTight delivers Fitness for your Body, Focus for your Mind and Fun for your Spirit! Seat Height: Adjustable from 21 inches to 26 inches (some variance based on pressure in air bladder). Pneumatic Cylinder: Stainless steel pneumatic cylinder with a 300 lb. weight rating. Saddle Seat Size: 20 1/4 inches wide by 15 1/4 inches deep. Detachable Design SitTight can be broken down into two separate pieces, of nearly equal weight, for easy transportation and storage. User Weight Limit 300 lbs.